It's not made of exotic - and fictional - comic book metals, but that's the only thing that separates this homemade shield from the real deal. 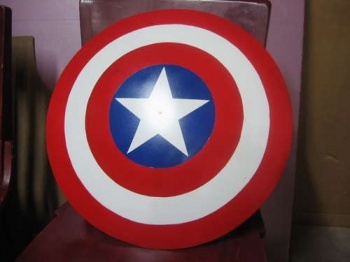 Some people like building replica weapons, others like building replica armor; but a poster on DIY website Instructables, calling himself "Seamster," has combined the two by making a replica of Captain America's shield, which is used to deflect attacks and whomp bad guys in equal measure. What's more, he's built it out of things you might find lying around - or on the side of - the house. The shield is made from old satellite dish, with a belt used for the handles. Seamster first disassembled the dish, saving the bolts for later. He then drew a circle on the back of the dish, and after a little trial and error, figured out that the easiest way to cut it out was to use a pair of metal snips, grinding down the edges so that they wouldn't be razor sharp. He then filled the holes were the bolts used to be, and ground down the nubs in the dish where they used to rest. Once that was done, he applied another type of filler and sanded the entire thing down until it was smooth. Once the surface was prepared, Seamster began the painstaking task of painting the icon design on the front of the shield. Finally, he attached the dish's original bolts to the back of the shield using epoxy resin, and used then to attach the handles, which were made of thick leather with holes drilled through it. As you can see, the end result is pretty special and the design is remarkably elegant. If you want to try your hand at making your own shield, you can follow Seamster's step by step guide on the Instructables website. Is it just me or has there been a lot of stories about people modding stuff into nerd gear like this lately? He did a good job on the shield, that should make Nazi's think twice before attacking his house. Nice shield, but as far as making gaming gear, its far from the most impressive thing i've seen.. Just basically sanding and painting, anyone not totally braindead should be able to make this..
That's some degrading. From an invaluable part of an incredible piece of technology, to an article of decoration. This isn't even impressive in it's entirety. Big whoop, it's not exactly an intricate design. Now all he needs to do is put the Satellite dish back up and he will have the best Satellite dish in the world! I almost want to lick it, it's that smooth and beautiful hand-crafted.